Anyone marrying in Hawaii can have a familiar western-style wedding ceremony, presided over by a justice of the peace or local minister. 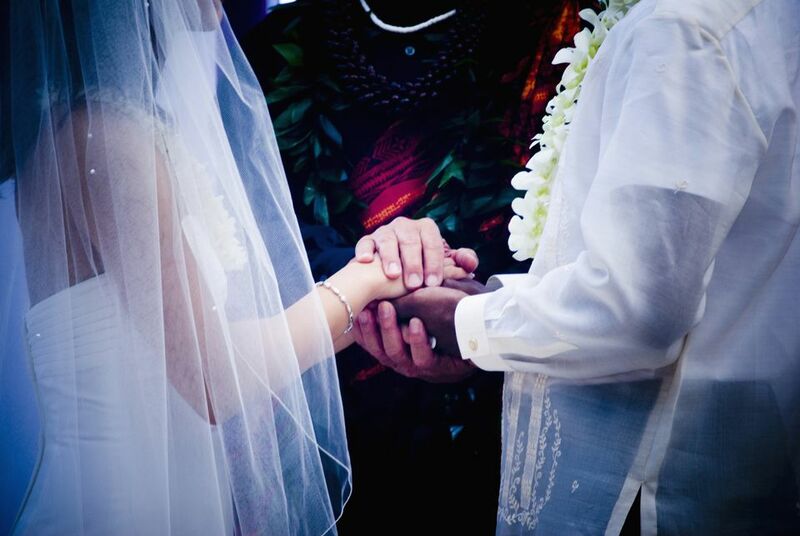 But some couples choose to embrace their marriage locale by incorporating a traditional Hawaiian wedding ceremony. Guests arrive at the ceremony locale to the sounds of ukulele music. The local minister, often called a kahuna pule or kahu (Hawaiian holy man), sings a chant (or mele) as he walks the groom (who, if he wants to adhere to tradition, should be dressed in white with a colored sash often red, at his waist) to the front of the ceremony. The mothers of the bride and groom are honored and escorted to their seats by members of their family. The bridal party (bridesmaids, groomsmen, flower girl, ring bearer) walks the aisle to the ceremony. The bride is announced by the blowing of a conch shell (or pu) to call the earth, sea, air and fire as witnesses. Only then does the bride, who wears a flowing white gown and a crown of flowers known as a haku, begin her walk down the aisle as her groom turns toward her. The bride and groom exchange leis, a symbol of their eternal love. Traditionally, it's a maile lei or maile-style ti leaf lei for the groom and a white ginger or pikake lei for the bride. Then the couple's parents present leis to them (either the groom's parents offering a lei to the bride and vice versa or each set of parents offering a lei to their own child). Then, the bride and groom each present leis to their soon-to-be in-laws, as well as to their bridal party. As the "Hawaiian Wedding Song" (Ke Kali Nei Au-"Waiting for Thee") is played on the ukulele and slack-key guitar and interpreted by hula dancers, the kahu leads the couple in a recitation of vows. Before the couple exchange rings, the kahu dips a koa wood bowl into the sea (koa wood, native to Hawaii, represents strength and integrity). A ti leaf, which represents prosperity and health, is dipped into the water and then sprinkled over the rings three times as the kahu recites a traditional chant. As the couple marries they stand in a circle of fragrant tropical blossoms. The bride and groom pour two different colored sands into a single glass container, mixing them and symbolizing that two have become one and cannot be separated. A lava rock, symbolic of the moment you made a commitment to each other, is wrapped in a ti leaf and left at the ceremony site as an offering commemorating your union.